When the Holy One, blessed be He, said to Moses: gather unto Me seventy men, Moses thought: What shall I do? If I bring five from each tribe the total will not amount to seventy and there will only be sixty. If I bring six from one tribe and five from another I will introduce jealousy between one tribe and another. What did he do? He took seventy-two ballots and wrote on them ‘elder,’ and another two ballots he left blank. Then he mixed then up in an urn and proclaimed: ‘Come and draw your ballots.’ A man who drew out a ballot inscribed with the word ‘elder’ knew that he had been appointed an elder, and one who drew out a blank knew that he had not been appointed, and the superintendent would say to him: ‘There is still a ballot in the urn inscribed with the word "elder," and had you been worthy of being appointed you would have drawn it.’ This procedure having been adopted, the elders were duly appointed. Eldad and Medad who were there withdrew into the background, saying: ‘We are unworthy of being among the appointed elders.’ In return for their self-effacement they proved to be superior to the elders in five things. The elders prophesied only regarding the following day; as may be inferred from the text, And say thou unto the people: Sanctify yourselves against tomorrow (Num. 11:18), while these prophesied concerning what would happen at the end of forty years; as may be inferred from the text, But there remained two men in the camp… and they prophesied (ib. 26). The problem of the extra two is sweetly resolved by a little exercise in mathematics and chance by Moses, and this is used to teach an important lesson about humility, which M’ Shoshannah touches upon in her comments in my weekly email, which you can subscribe to here. This is, indeed, the heart of the lesson, and it is important not to brush it aside. And yet there is, of course, more. 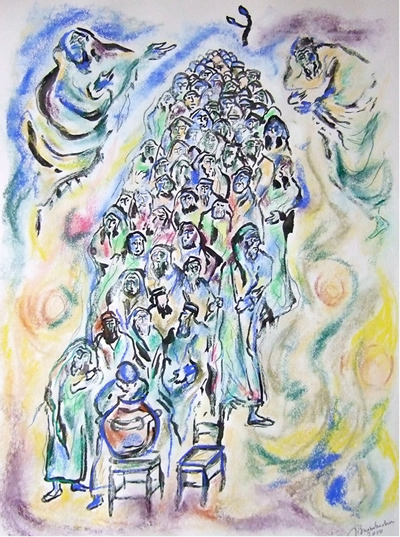 The word which the midrash (and many older editions) translate as "prophesy," as in foretell the future – vayit’nab’u – can also be translated as to "speak in ecstasy." This meaning (adopted by most modern translations) is more correct, in that the notion of a prophet foretelling the future is largely foreign to traditional Judaism. Indeed, the evangelical sense of "speaking in tongues" is much closer to what happened to these seventy-two men. Their actions were perceived as strange or inappropriate by the other leaders, who tried to restrain them, but they were clearly seen by Moses as not being merely tolerable, but actually desirable. He cries, Would that all the Lord’s people were prophets, that the Lord put His spirit upon them! (Num. 11:29). The two men are named Eldad and Medad. My Rebbe, M’ Yitzhak Buxbaum, reminded us that in Hebrew, the suffix dad means "breast." Here the Ha Kodesh Baruch Hu’s spirit – ruach – settles on these two, and they become the nourishers of the people, their ecstasy being the Divine milk that comes in words not understood, but felt. Is it any coincidence that when we speak of the moment of G!d’s effecting the material world we call that the Shekhina – the feminine side of G!d? What a nourishing, nurturing experience it is to allow ourselves to be sheltered and fed, in simple joy or profound ecstasy, by the Eternal One! And, lest you forget, each one of us has only to invite the Divine in, with openness, vulnerability, and humility, to taste that sweet, sweet nectar. This entry was posted on Sunday, May 23rd, 2010 at 7:10 am	and is filed under Judaism, Spirituality. You can follow any responses to this entry through the RSS 2.0 feed. You can leave a response, or trackback from your own site.